GeoShred, Winner of 2017 Electronic Musician Editor's Choice Award as "one of the most innovative, groundbreaking products to emerge in the past twelve months". GeoShred is an expressive musical instrument with a multi-touch performance surface, coupled with an advanced physical model of a guitar. A fusion of Wizdom Musicâ€™s Geo Synthesizer user interface (Jordan Rudess), and moForteâ€™s powerful, modeled guitar and effects chain based on the next generation Physical Modeling research of Dr. Julius O. Smith III of Stanford/CCRMA. Add to that, incredible support for MIDI/MPE which makes GeoShred both a powerful synth and a formidable MIDI/MPE controller! GeoShred is NOT just another app. 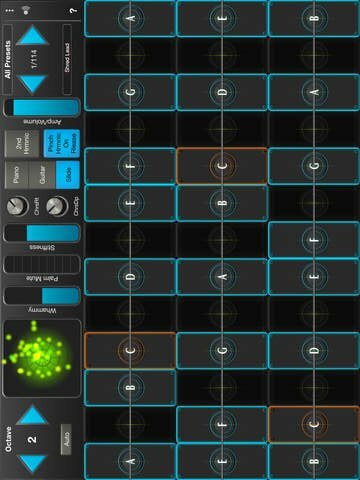 GeoShred is a powerful, musical instrument that offers a performance environment on a multi-touch surface unlike anything youâ€™ve ever experienced. â€¢ A diatonic keyboard where every key on the screen is in the scale. â€¢	Inter-App Audio and Audiobus support. â€¢	Unique mono mode using intervals of multiple strings. â€¢	Support for world scales and temperaments including Indian Ragas, Arabic and Balinese scales. Minimum Requirements: iPad2, iPhone 4s, iOS 9.3 or better. For AUv3 support iOS 11.4 or greater is required.